Let our VAC Motorsports High Performance Valve Spring & Retainer Kit extract the most from your M44 camshafts! 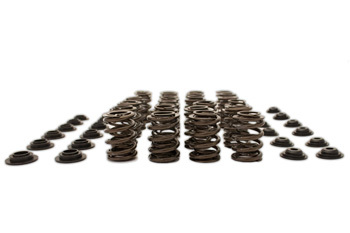 Our VAC High Performance BMW Valve Springs are a dual-spring interference design that is made from H-11 Alloy, a metal often used for highly stressed structural parts (such as aircraft landing gear) that also offers resistance to thermal fatigue. Each spring is shot-peened for stress relief and dual-interference fit to control harmonic resonance across the rev range. In our dual spring configuration, should something happen to one spring, the other can prevent the valve from dropping and causing catastrophic engine damage. VAC Titanium Retainers offer an extremely light weight choice for racers that are determined to maximize performance down to each gram of the valvetrain. Ideal for very high RPM extreme race & sprint use. Q: When would I use titanium retainers vs steel? A: The ideal use is when you plan to switch to solid lifters or are building an all out race engine that will be regularly inspected as the wear life is not a extended as the VAC steel alloy version. These kits have worked flawlessly with every camshaft we have ever installed, including those from Schrick, VAC, Sunbelt, Cat, and others. From the reliable and winning results of thousands of our spring assembles, we can say confidently this represents the best set available for your BMW at any price.